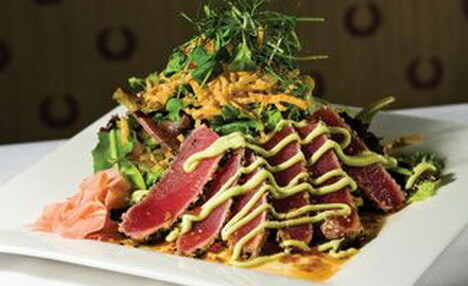 « Homepage / Food and Healthy Eating / Recipes / "Sesame Crusted Yellow-fin Tuna Salad with Asian Vinaigrette"
This is the most popular salad on the menu at the Dakota restaurant in Covington. It is light and refreshing, perfect for spring. It was created by Chef Kim Kringlie. Heat oil in a sauté pan until hot. Season tuna fillet with salt and pepper. Mix together sesame seeds and coat tuna thoroughly. Place tuna in hot oil and sear on all sides (keep rare). Slice thin for salad. Heat sesame oil in skillet and sauté ginger and garlic until tender. Add pepper jelly and heat to dissolve. Place mixture into small bowl and blend with remaining ingredients. Serve with sliced yellow-fin tuna and your favorite greens, vegetables, or crisps. Garnish with pickled ginger. Serves four. Here you can write a comment to the post "Sesame Crusted Yellow-fin Tuna Salad with Asian Vinaigrette"